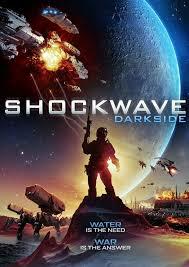 Darkside (2014) film review. Favorit Films,Red Giant Media, PipelineEntertainment. Directed by Jay Wiesman. Distributed by Uncorked entertainment US, 101 Films UK. 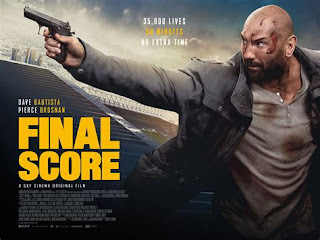 Running time 92 minutes. Certificate 15. 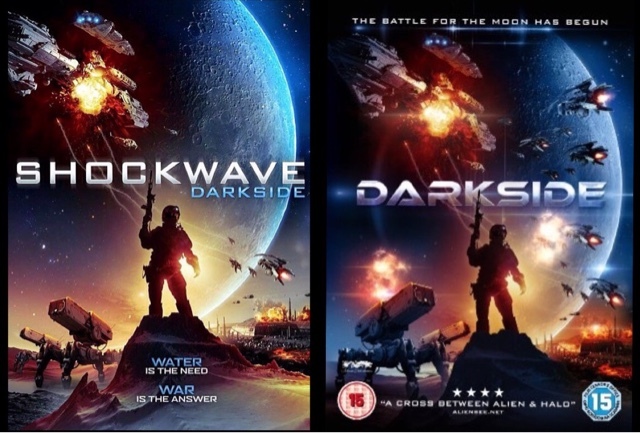 Above is two versions of the same film,the left is the US version, named Shockwave Darkside,the right is the UK version currently available from the 11th July,by 101 films. 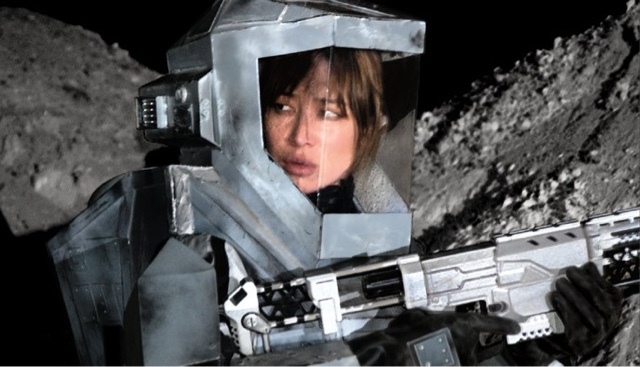 Here we have a sci-fi premiered at London Frightfest Film Festival August 2014, I knew nothing about this film,and went in blindly, it is only since I have watched the film,that I have experienced all the severe negativity,and to be honest I like to find the good in any film,well unfortunately in this I could not find anything. 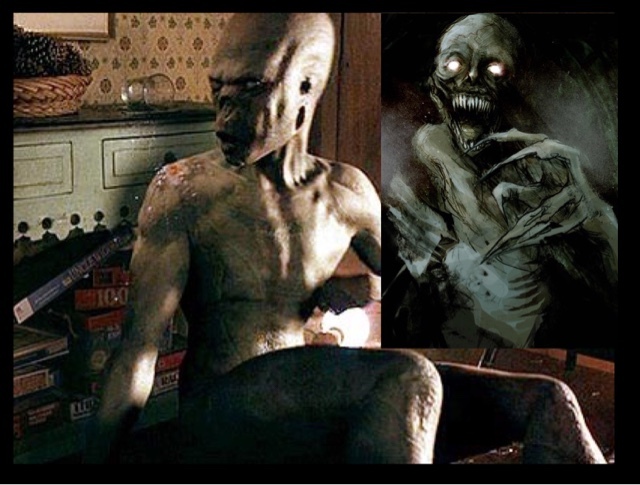 We have another post apocalyptic story of the Worlds Waters being polluted by a Nano Plague, to then have Alien invaders, force the rest of humanity to repopulate onto the moon. With a new invasion launched from Earth 'The Unlight' Alien invaders,have found pockets of water on the Darkside of the Moon,and we have a battle for the natural resource, all living things need and that is water. On paper or even script it has a decent idea,but with a completely confusing,and ridiculous script,that starts immediately, with no Titles, just computer software imagery, that introduces us to the cast,or crew,with just a little introduction what has happened on earth, with a daft voiceover, that gives no insight. I had to google the plot line, as the movie actually has none. I have seen Thousands of movies in my lifetime, although this is not the worst, and believe me I have seen some turkeys, it is definitely up there. A film originally filmed in 3D to show off the 3D effects, with constant computer Imagery, flashing up on screen, which in all honesty is the only good looking part of this film. With the only decent character who can act Sonequa Martin,who is a Regular on The Walking Dead, is the only character I cared for. The So called Tough Talking Mei Melancon, as a character called 'The Machine' was as wooden as the cardboard suits the actors were wearing. All in all I cannot recommend this film,the acting is terrible, the costumes look like they were borrowed from a 1970's Dr Who convention,with spray painted nerf guns, parading as weapons, this film is a definite no from me, and I love Sci-fi and horror.